It starts in July. The advertisements for things you can't live without. Oh, PLEEEEASE! By October the annoying carols are beating your ears senseless. It is like listening to the opening and closing of a rusty door for hours. When water-boarding doesn't work, terrorists probably resort to the constant onslaught of Christmas Carols to force prisoners to rat out their mothers. If other people want to spend days putting up tinsel that will only murder their vacuums, or killing trees to park in their living rooms so they can watch them slowly wither and die, that is fine. It just isn't for me. We stopped allowing my Mom to put up a tree when we were in junior high. She had to decorate a small live one. My poor Mom. But, then, I've never seen much of anything in the way that the mainstream human population sees things. I used to irritate my family, pushing them to volunteer to cook at a shelter on Christmas Day rather than the usual big family meal with presents and such. THAT suggestion wasn't entertained past the immediate response of "NO!" And, I hate to admit it, but when my Mom died, the first things to go were the 8' Christmas wreath (which now hangs outside an area church that appreciates it), the plastic holiday 'greens' and the red table cloth. Long ago, she used to put a red light bulb in the street light in front of our house, though. She probably stopped it when someone mentioned that people traveling through town thought we ran a brothel. I'd consider returning to that tradition, just for fun……. Not being a hunter, I have a personal aversion to camo clothing (I understand you can now get wedding dresses and baby wear in camouflage - in case you want to take your 3 month old or your new bride out to kill something for that truly special occasion). In the same category, I don't get the holiday sweaters. They aren't awful, but I just don't see the point in owning a sweater covered with Christmas lights, packages or wildlife with big red noses. But, today I decorated for Christmas. 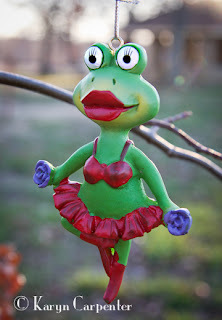 I found this frog - lovely thing with big red lips, wearing a bra and a tutu. It looked like my Mom. So I bought it . Off I went to the park and tied it to the tree which the city put up in Mom's honor. Right now the tree is a baby and looks like Charlie Brown's Christmas tree, and you'd have to be walking right next to it to notice the frog, but since the frog reminded me so much of Mom, and since she DID like Christmas, it all seemed fitting. 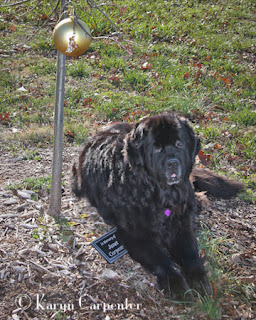 A friend went along with me and attached an 8 or 9" gold ball to the tree as well. THAT will get some attention. Twiggy tree, with one extravagant big gold ball and, if you look closely, this kinda slutty looking frog. I love it! I figure you can be a Scrooge to a point - then one needs their own quirky way to celebrate. Still, I'll be glad to see an end to this season. I used to love Christmas. 3 Christmas's ago after the death of 2 people whom I loved dearly passed on I totaly lost the spirit. I can't wait for this to be over. How About the Over Employment Rate?